The basic executable unit of anything that you build with Talend is a Job. In essence, a Talend Job is a single Java Class. It's worth remembering this as it helps in understanding how your Job works and the scope of information available to you, as a developer. A Job will include one or more SubJobs. A SubJob is a single component or a number of components that are joined by data-flow. A Job will have at least one SubJob. 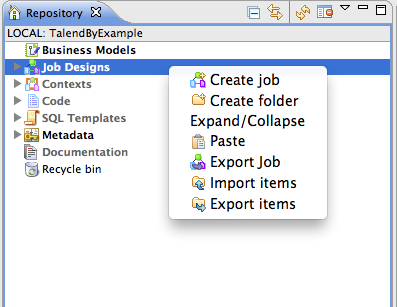 To create a new Talend Job, right-click Job Designs in the Talend Repository Browser and select Create Job from the Context Menu. If you haven't created a Talend Job before, take our tutorial My First Talend Job. As with any development environment, it is important to re-use code whenever possible (see Talend Best Practice). It is also good practice to use existing Jobs as templates, or to create specific Job templates for general types of tasks. This means that your Jobs become uniform, easy to maintain and your coding effort is greatly reduced. 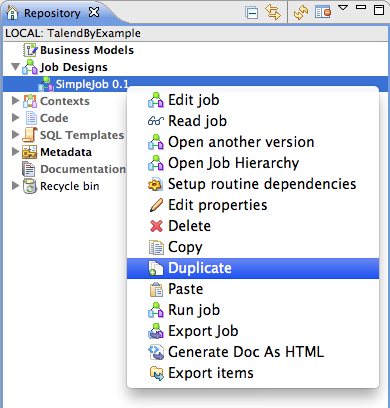 Talend allows you to duplicate, copy or paste an existing Job. 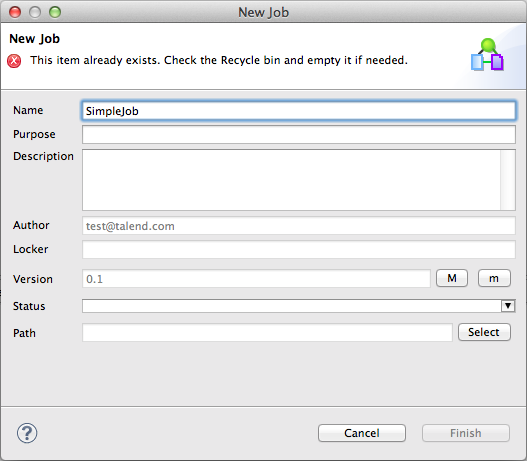 To do this, select a Job in the Talend Repository Browser and right-click the Job to activate the Job's Context Menu. 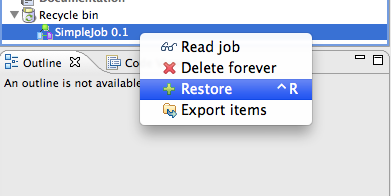 Talend allows you to delete a Job, by selecting Delete from the Job's Context Menu, as shown in the screenshot above. If you delete a Job (or any other Repository item), it will be placed in the Repository Recycle bin. This is a useful feature as the Recycle bin allows you to Restore a deleted item until such time that it has been Deleted forever. If you try to create an item with a name that has already been used (even if the item is in the Recycle bin), Talend will complain that the item already exists; but it will not tell you if it is in the Recycle bin so always remember to check.